As we join together to celebrate the life of this great American, it's good to reflect on how far we've come, but just as important to remember how far we have to go. Today's great B side was released in 1971, and its powerful message still rings true today. Recorded during the heyday of New York Soul (when Godfather still lived off 178th Street in Saint Alban's), it's the real deal. 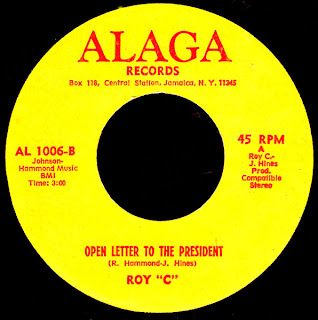 As the proprietor of his own label, Roy C Hammond was able to speak his mind, and often did (according to Roy, his Impeach The President has been 'sampled' over 200 times). "Listen, Mr. President, yeah, this is an open letter to you. I want to know, why don't you stop the fighting and bring all our boys home, that's right..."
Damn, Red, you're makin' me cry. A total masterpiece. This and Impeach The President, cut with the Honeydrippers, mark Roy C. and was on e of the greatest political singers in America. whoa yeah! this is great, the first guitar drum break is AMAZING! Just found a copy of this at a flea market ON 25th St. in Manhattan. Love it. Thanks for the back-story. Peace.